This 1 day Introduction to self injury training course is only a basic introduction to the topic. It’s intended for social care workers who may or may not have any prior experience of the subject. The course challenges the prejudicial myths, value judgements and assumptions that surround self-injury and the people who habitually cut, burn or otherwise harm themselves. It offers practical guidance in working with people who repeatedly harm themselves without getting bogged down in unhelpful criticism and blame. By comparing self harm to more ‘acceptable’ (but often more harmful) coping strategies like smoking, drinking or general impulsivity we normalise the action as a means of self-soothing before extending the comparison to less dramatic strategies like walking, bathing or even just watching a favourite film. The aim is not to make participants experts. Rather the course is intended to remove prejudices and offer a simple explanatory model that isn’t based upon value judgements or unsupportable assumptions about manipulation or attention-seeking. 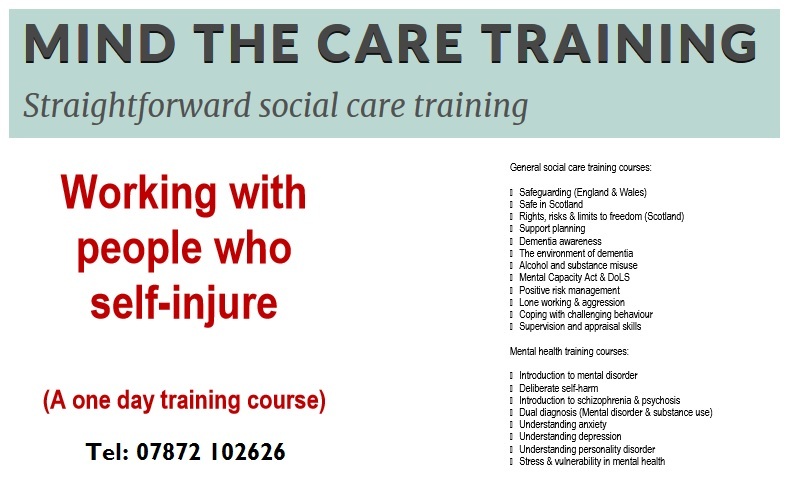 Click here to discover more about how Mind The Care Training can help you and your staff. Previous Why all the fuss about human rights?